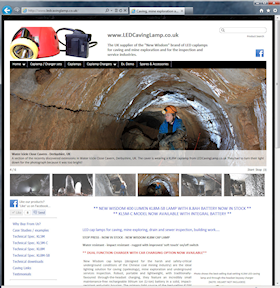 LEDCavingLamp.co.uk is a WyeTec-owned enterprise importing and selling specialist lighting equipment to the sport (caving / mine exploration) and industrial (mining, confined spaces working, night working) markets. The range of products has been expanded recently, necessitating an upgrade to a more complete e-shop, rather than the simple "buy now" model that had previously been appropriate. At WyeTec we’re proud to use our own technology, and building an e-commerce website based upon our proprietary shopping cart technology was an obvious choice. It also provides a real-world platform on which we can test, develop and enhance the shop features – and any such enhancements are instantly available for new shop implementations. The shop was quickly indexed by search engines, and generating sales of the new product lines – providing good motivation to extend the product range yet further. Passive on-line marketing through natural search engine listings has been backed up by a variety of powerful marketing methods. 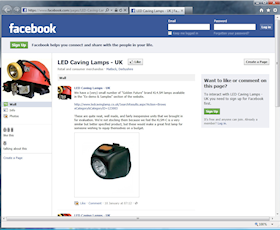 LEDCavingLamp.co.uk makes good use of WyeTec’s e-commerce package to sell specialist lighting equipment on-line. An e-mail marketing campaign was launched to alert all previous customers and enquirers to the new site and products. The targeted nature of the e-mail marketing campaign meant that an astonishing click-through rate of 21% was achieved. Targeted advertisements were placed in relevant printed publications. These printed advertisements utilised the shop’s "voucher code" functionality, whereby site visitors can obtain a discount by redeeming a voucher code during the checkout procedure. These controlled and traceable discounts make excellent incentives, helping to boost sales and build customer loyalty. Above: As well as natural listings on Google, Bing and other search engines, LEDCavingLamp.co.uk is promoted through channels such as Facebook and printed advertising, all of which help to drive visitors to the site and generate orders. A Facebook page has also recently been set up, providing a community-based method of spreading the word about the website and encouraging visitors to 'like' the products and website. Contact WyeTec today to discuss your e-commerce requirements.